I am always thinking about time. In many ways, we live in terrible times. Also, it is said that if you travel far enough into the future you will actually go back in time. 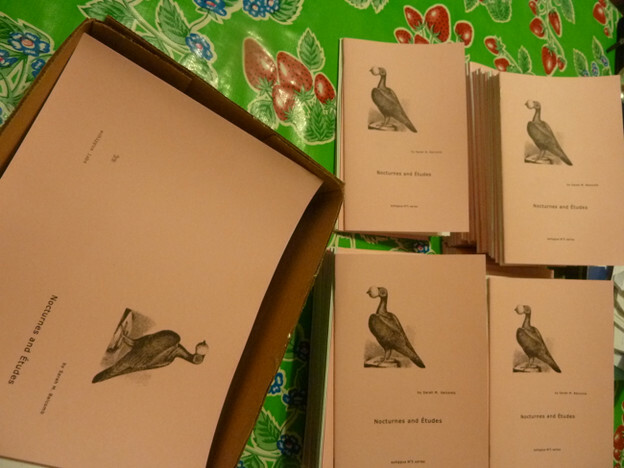 eohippus labs is a short-form literary micropress based in Los Angeles. I co-edit the press with Harold Abramowitz, who is also someone with whom I write collaboratively, and he is also one of my best friends. The Evenings of Various Wonder occur as an entirely homemade, occasional, and joyful labor of love. I organize them when friends from afar whose work I am excited to share with the local literary and arts communities are coming to Los Angeles at a time when I have the space and wherewithal to host an event. Performers have been from many places in the U.S., from India, from Mexico, from all across Los Angeles, and from right around the corner in Cypress Park. Audience sizes have ranged from around 40 to around 120. Red Shout! 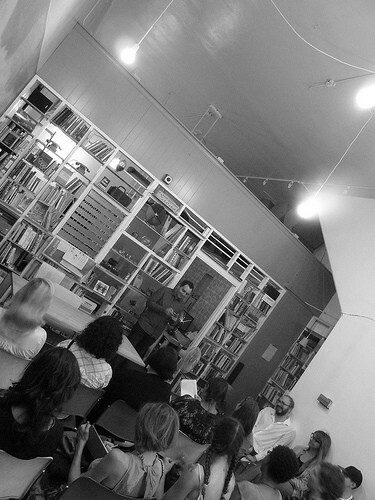 was a month long, four-part reading series held each Friday night as part of the LA Liberation School. But Red Shout! was, properly speaking, also just a part of the day, the conclusion of the Liberation school week, so to speak. Red Shout! took shape, then, in the context of a set of practices that diverged from those of the bookstore, gallery, and house reading series. 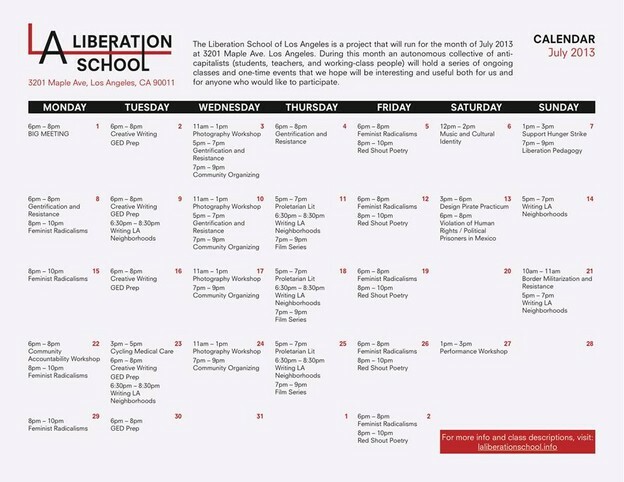 The LA Liberation School was/is a free university project that ran formally for the month of July 2013 in a live/work warehouse on the border of East and South Los Angeles. It has since transformed into a loose network of reading groups and organizing meetings held in various locations (I have since been away from Los Angeles and so have not been able to participate). Those who facilitated the School's operations tried to create a space that would escape the segregation that characterizes other public education projects and to create material practices to hold better space for thinking.